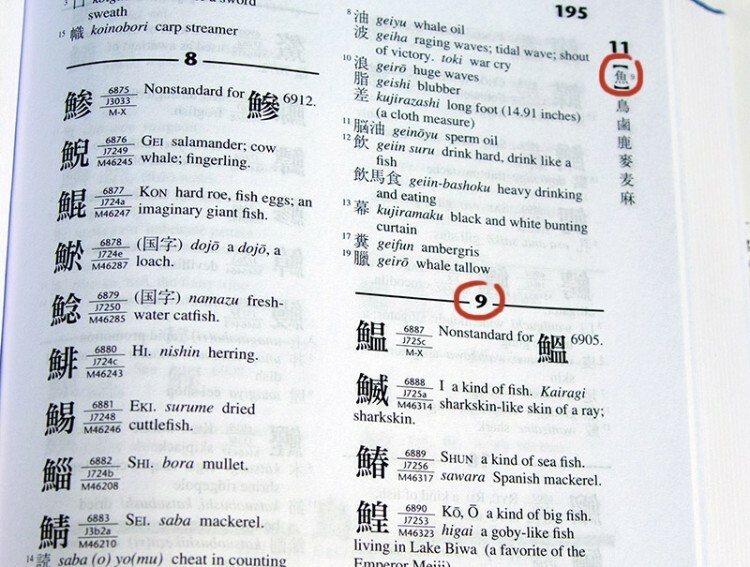 How to Use a Kanji Dictionary Someday you might use one! 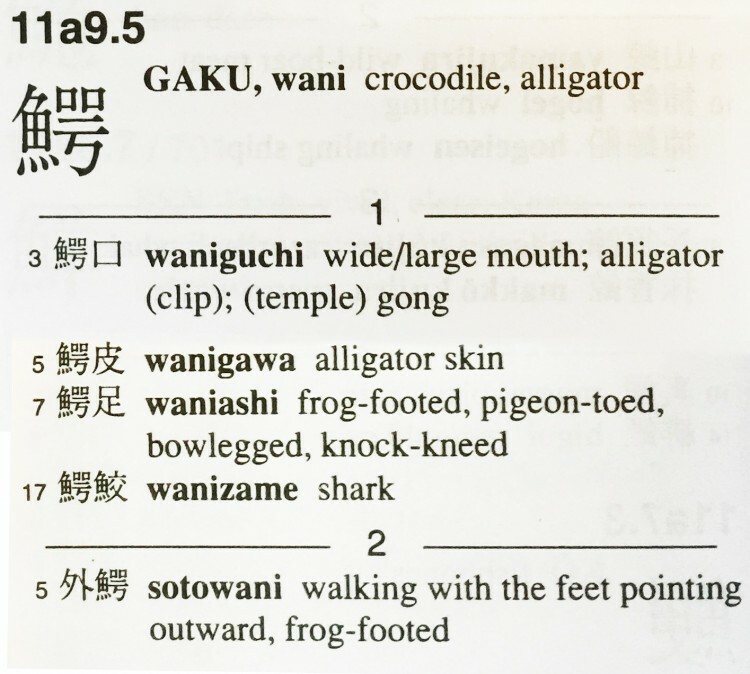 There's nothing like a good kanji dictionary at your side. 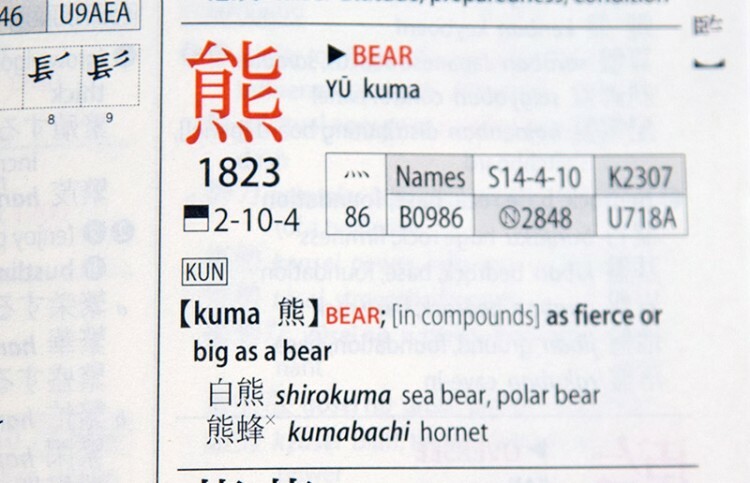 While online resources have become more and more popular, having a good dictionary is still pretty important if you're going to take Japanese classes or plan to work in Japan. 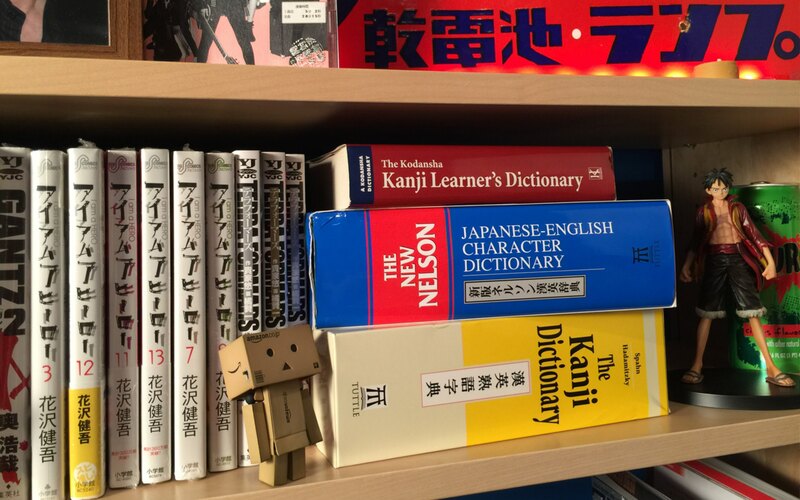 There are a lot of different kinds of kanji dictionaries out there and it can be really hard to know which one to buy, let alone trying to figure out how to use the thing. I can't tell you how many people I saw buying the required kanji dictionary for a class and never once picking it up, let alone using it on a daily basis. I realized that many people don't know how to use the things, and unfortunately, not every kanji dictionary is the same. 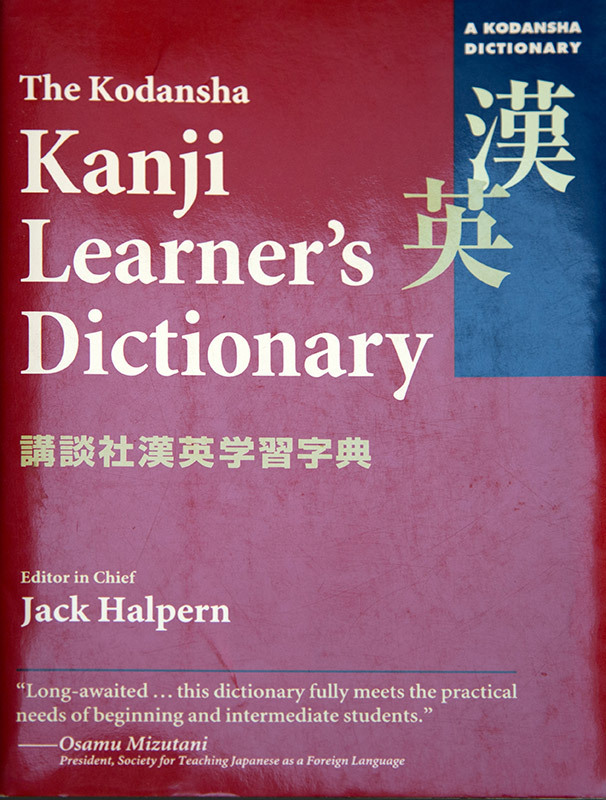 So for all of you out there who have a kanji dictionary sitting on your desk, in a pile of other books, or propping open their door, hopefully this guide can help you get some miles out of it. 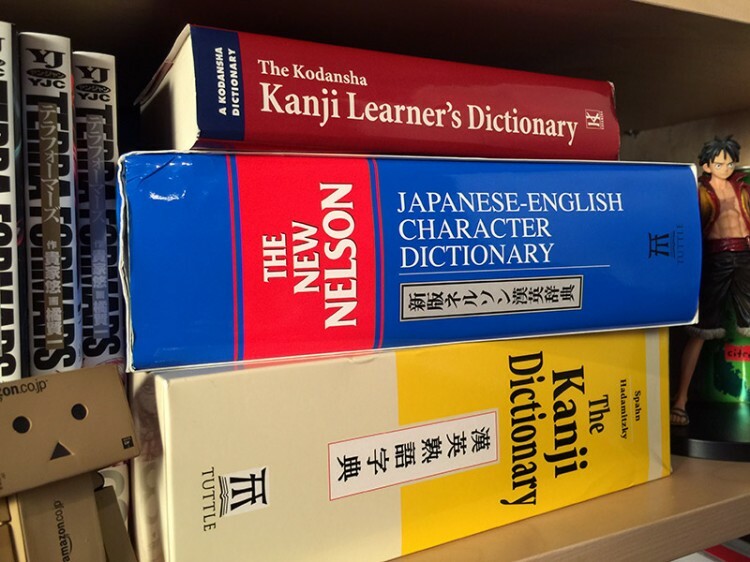 We're going to be looking at three popular kanji dictionaries in depth, the New Nelson, Kodansha's Kanji Learners Dictionary, and The Kanji Dictionary by Spahn & Hadamitzky. Is it suitable for your language level? Does it provide the information you're looking for? Is it structured in an easy to understand format? If you're new to Japanese, if kanji are still a bit frightening or seem like a chore, you might want to go for a beginner's dictionary. They'll usually include a good chunk of the most common Jōyō kanji (taught from elementary to secondary school, usually about 2000 or so), plus a few additional kanji here and there. Usually, this type of dictionary will be sufficient all the way up and through intermediate Japanese. However, once you reach the higher intermediate and more advanced levels, you may notice more and more of the characters you're trying to look up are not included. Once you hit that point it's time to move on to a larger dictionary. It's rather important to know what it is you're going to be looking up in your dictionary. Generally, if you find a word or character you don't recognize in a book, on a sign, or even online, you would look it up in your dictionary to find the reading and/or the meaning. 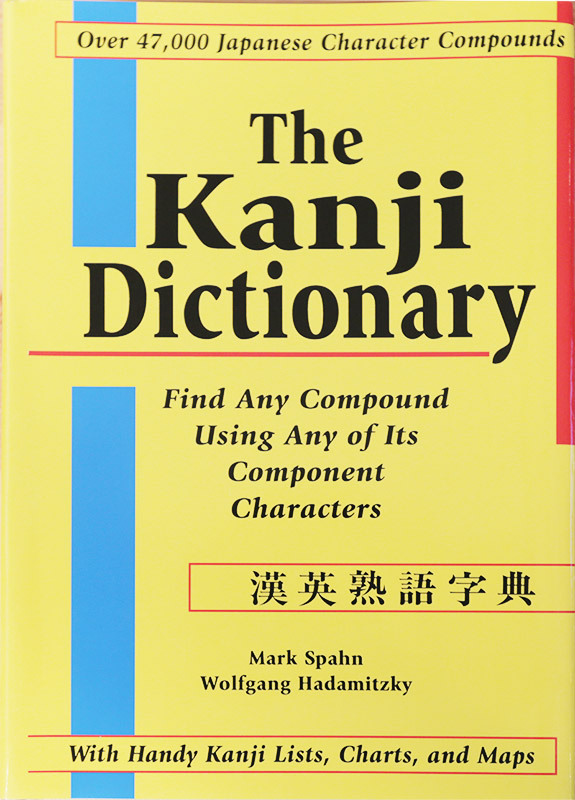 Some dictionaries only give you the basic meaning for the kanji and list a few compounds (the kanji in the entry plus other kanji to make one word) and their readings and meaning. Your own preference is also something to consider. If you pick up a dictionary and it makes your head spin, if you can never seem to find what you're looking for, and you just get frustrated, don't blame yourself. Sometimes you won't mesh well with a dictionary. I went through three or four before I found one that I felt comfortable with. If you can, go to a bookstore or a library and flip through a few before you buy one. If you don't live in an area where that's possible, look online and read reviews from other people. See how they feel and try to use your best judgement. Also, don't feel bad about having more than one dictionary. The good thing about their differences is that if you can't find something in your go-to one, you may be able to find it in the one collecting dust on your bookshelf. To find the word you're looking for, first you need to find the radical, and there are a few different ways to tell what the radical is. You may be thinking, but aren't kanji made up of radicals? How do you find the radical? 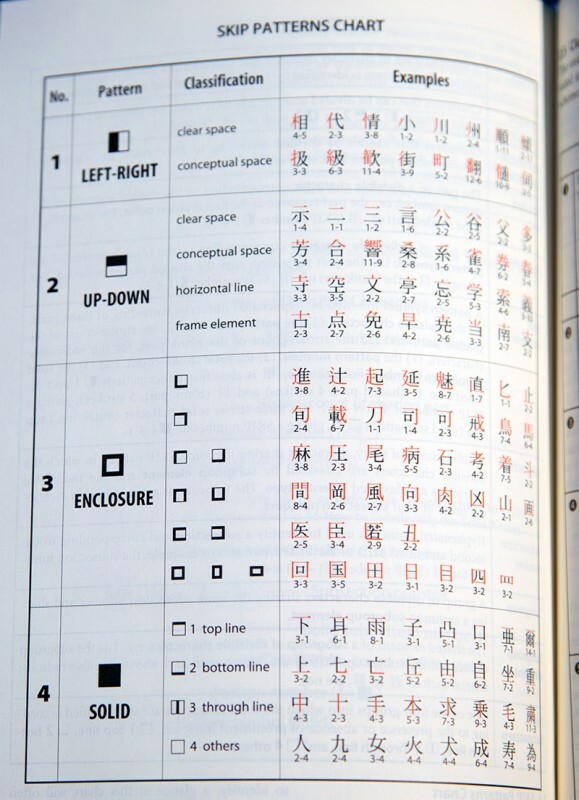 Well lucky for you there is a twelve step guide to figuring out which radical the kanji you're looking for will be listed under. This same guide (in more detail) is included in the appendices of the New Nelson as well. If you don't know how to find the radical yet, check out my other guide How to Find the Kanji Radical. That number under the radical, in this case 195, tells us what section to flip to in our dictionary. Here we find the section for this radical. Now we need to count how many strokes there are in the character OTHER THAN the radical we found. In this kanji there are nine more strokes, so we go to the section labeled nine. Flip the page and there's our entry. Here is another example, let's use the kanji kani 蟹（かに） this time. First we find the radical, which in this case is 虫 in our chart. The radical number is 142, so we go to section 142. So how many strokes are there minus the radical itself? Thirteen. We go to the section showing the radical plus thirteen strokes. 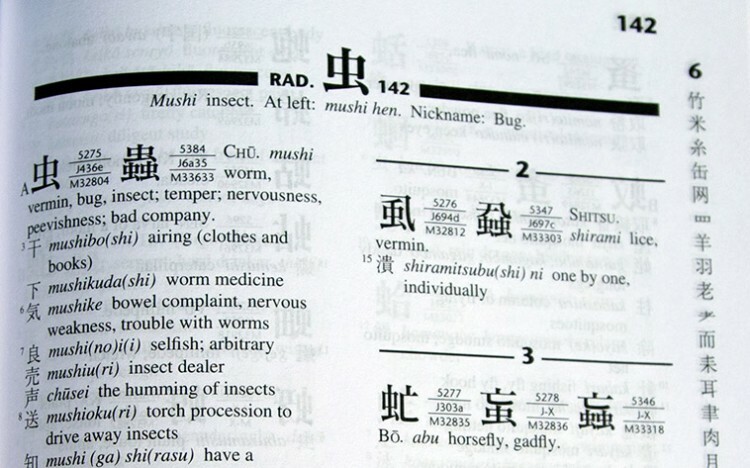 And here we find the kanji entry for 蟹. 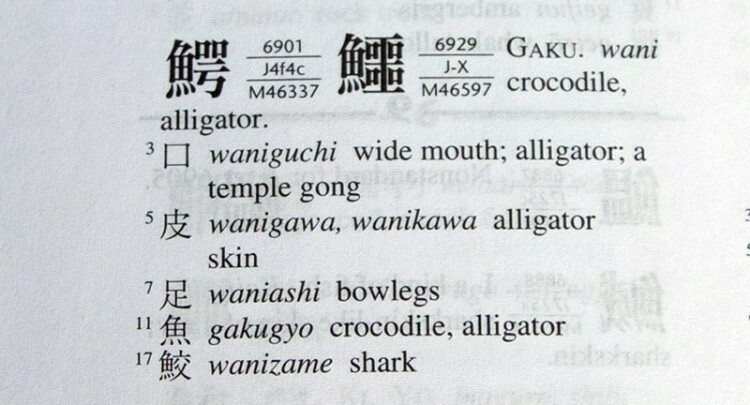 It's important to know the kind of information you're getting with your kanji dictionary. Before you buy or commit to one over the other have a look at what it can offer. Here is an example of an entry and what it tells us. Let's go back to wani 鰐（かに）. M46337, Morohashi's Dai Kanwa Jiten. There is also another character next to the entry we're looking at, 鱷. This is a variant form of the character we're looking at. Sometimes characters that are no longer used because they have been simplified to another version can be found here. 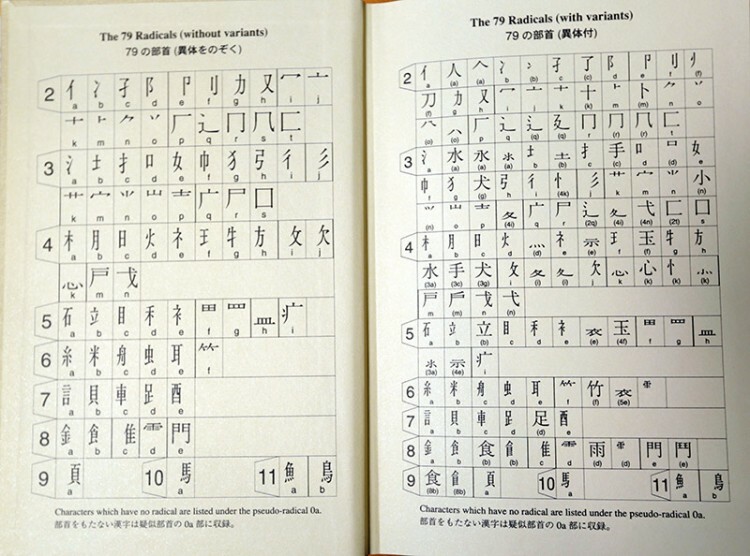 This is useful because if you are reading something written during or before WWII, they may use these older kanji. If there was the letter A next to the character, it would mean it is one of the 1006 characters selected by the Ministry of Education that elementary school students should know. On the other hand, a capital B means that while not learned in elementary school, it is still one of the characters on the Jōyō Kanji List. If you plan on studying kanji on your own and need a list to go off of, you can use these markers to decide which ones you should be studying. Then we have the on'yomi (capital letters) and kun'yomi (italics) readings, as well as the meaning(s) of the character. Beyond that, there are more kanji with their stroke orders to the left and their readings and definitions to the right when they are used with the entry character before them in a compound word. 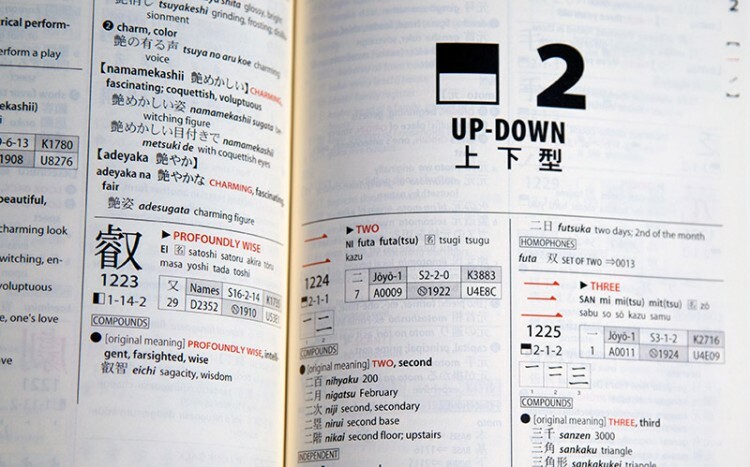 Unlike the New Nelson, Kodansha's Kanji dictionary is organized using a pattern system. They look like they use four of the seven general radical locations, but their categorization uses them in an altered fashion from what you may know them as. 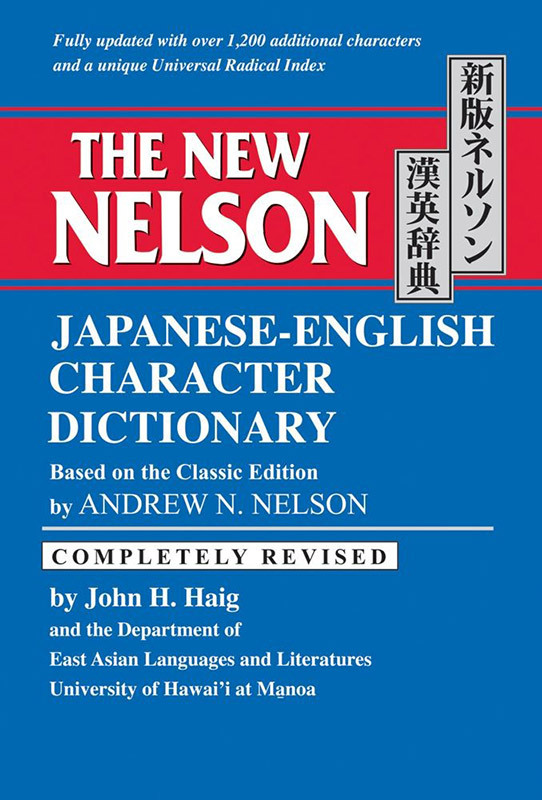 This is more of a beginners character dictionary, and it does not have as many entries as the New Nelson, however, it may be more useful to students who are trying to learn the most used kanji. They layout and more durable pages may also be a better fit for someone who doesn't want to sit and pour over their dictionary. In order to find the character you're looking for, you still need to be able to find the radical. Once you've done that though, you need to also determine it's location. Let's use kuma 熊（くま） as an example. If we use what we already know, that the radical is 灬 is a variant of 火, then how do we know what pattern it fits in? Well if we look at all four options it is fairly easy to see that this sits on the bottom of the character, making it No. 2 the Up-Down pattern. At the top of every page there is a pattern, we want to go to the second section labeled with the Up-Down picture. The easiest way to find the radical you're looking for in this dictionary is by using the "skip numbers" that are meant to allow you to skip the tedious work to get to the character quicker. To find the skip number we need to count the number of strokes in the character, but this time we need to know the number of strokes in the shaded area and then in the non-shaded area. Under the character the "skip number" is also listed. It's 2-10-4. 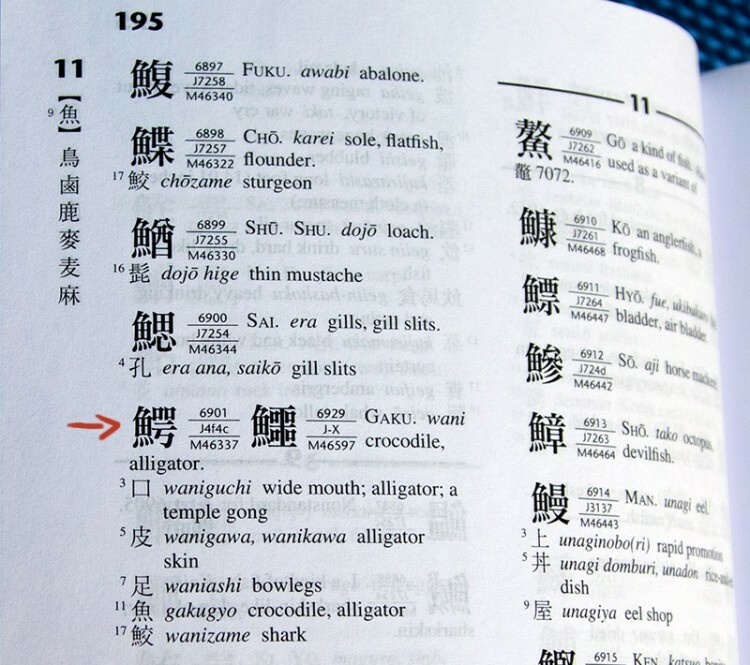 Let's look at what this dictionary entry can tell us about 熊. 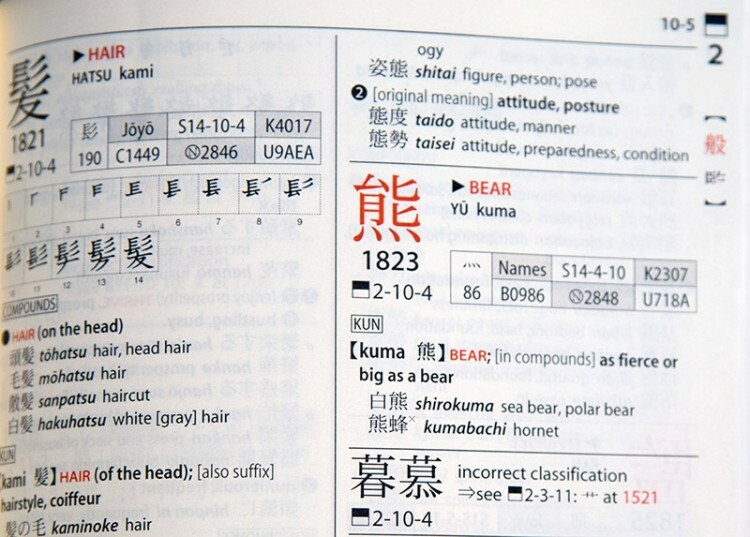 The character is in red (showing that it is a frequently used kanji), as well as the english "core" meaning: Bear. The on'yomi (capital letters) and the kun'yomi (lowercase letters) is just below the meaning. The "Names" means that it is a character in the Jinmei Kanji list. S14-4-10 is the total number of strokes, the radical strokes, and the remaining strokes. K2307 indicates how to located the character within the Japan's Industrial Standard code. B0986 is the frequency level. N2848 is the entry number for this character in the larger version of this dictionary. U718A is the international unicode character encoding standard. In addition to that we also get come compounds that contain the character, their readings, and English meanings. Stroke order is also provided for all the Jōyō Kanji, but because this is not on that list, it has no stroke order listed. Instead of flipping through pages looking for the pattern numbers, you can always look for the page number using the pattern index at the back of this dictionary. 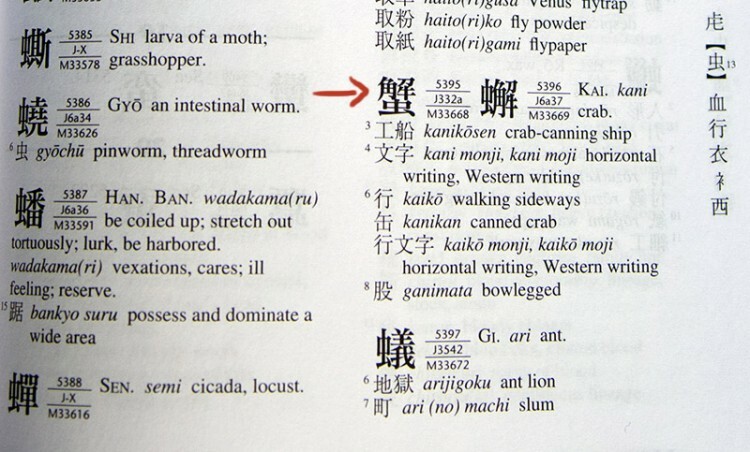 You may be wondering why we didn't go with our previous examples 鰐 and 蟹 this time. Well, the downside of getting a smaller, easier to use dictionary is that they usually don't have that many complex kanji. 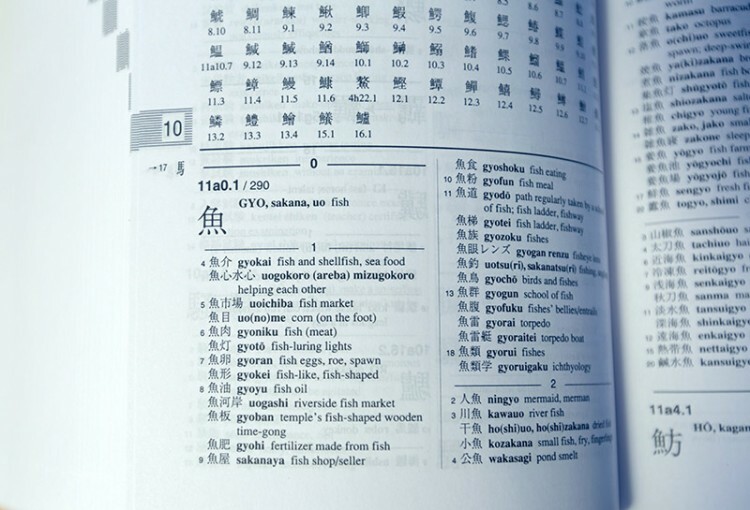 While this is a beginners dictionary, it should still do a very good job of telling you everything you need to know as you start to delve into the wonderful world of kanji. That being said, it's by no means cextensive. And while you're getting a lot of information like in the bullets above, you probably wont need any of that information until you're much farther into your studies. At that point you'll probably need more kanji in your dictionary. This is the case with every dictionary, eventually you'll have to move on to a bigger, better one, to fill in the gaps, so to speak. This dictionary is more of an intermediate dictionary, boasting "over 47,000 Japanese character compounds" right on the cover. If you can't get into the New Nelson or Kodansha's Kanji Learner's, then this may be the happy middle ground you're looking for. Once again, you need to be able to determine the character's radical and the number of strokes in a character to use this dictionary properly. Unlike the other two, however, instead of using the 214 Kangxi radicals or organizing radicals by their location patterns, Spahn and Hadamitzky's uses a smaller set of 79 radicals. 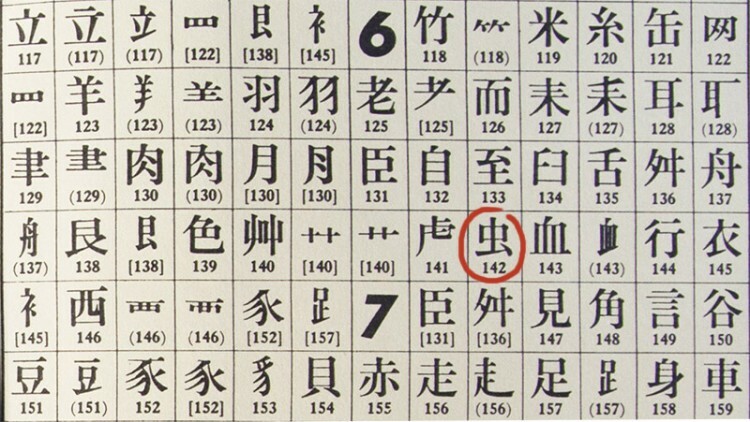 The authors argue that the kanji commonly used in Japanese do not require the 214 Kangxi radicals created for use in China because there are so few comparatively. They're still using a good chunk of them, just cutting it down. They also offer a cross reference in the indexes if you're used to the traditional system and have trouble transitioning. Let's go back to the kanji 鰐. 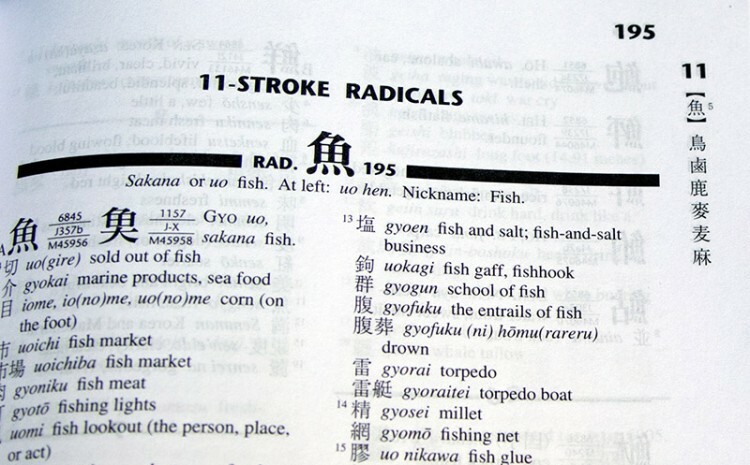 We know the radical is 魚 which is listed under 11 because it has 11 strokes. It is also the first of the two radicals in this category so it's 11a. Now we need to flip to the section for 11a. 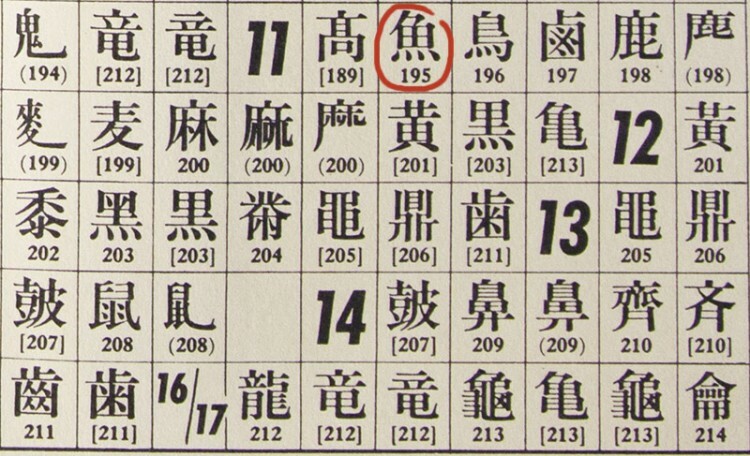 Here we'll see a very convenient chart of all of the characters located in this 11a section, and scanning through we find our kanji in the middle labeled 9.5. Add that to the first part and you get 11a9.5 – that's how the character is classified in this dictionary, it's descriptor. So looking at the top of the pages, we flip to that section to find our entry. By now this should feel a lot easier. Let's take a look at what this dictionary has to offer in it's entries. The first thing we see directly to the right of the character, in capital letters, is the on'yomi GAKU. Then next to that in lowecase is the kun'yomi, wani, and the definition. Next we have two different categories, 1 and 2. The 1 means it's the first position in a compound word while the 2 means it is the second character. In other entries they can go higher to the third or fourth position but in this case it only occurs in two kanji compounds. The small numbers next to kanji compounds represents the number of strokes in the other kanji in that compound. This does not include the character in the entry. Last, you have the romaji reading and then the definitions of those words that include the kanji 鰐. You may have noticed that this is a lot less information than the other two dictionaries offered. 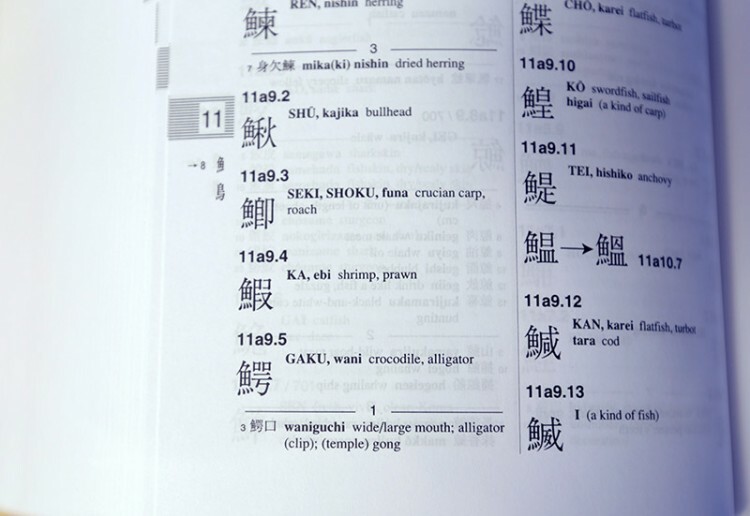 If you're the kind of person who thinks they will never need to know frequency levels, or what grade a kanji is learned, this dictionary contains a lot of words for being so simple. It's probably best for intermediate learners, but you may learn with time that you need something with more, like the New Nelson. But as far as basic information goes, this one is great. In the end, picking out and buying a kanji dictionary is up to you. Find one that fits your style and has what you need in it. 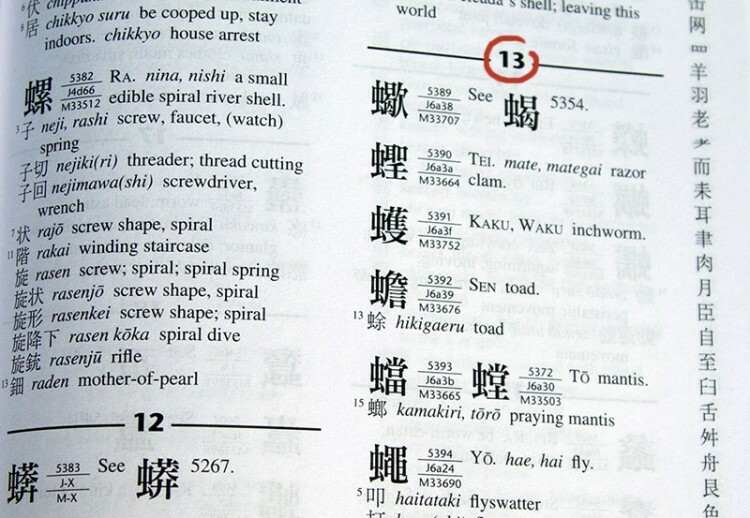 If you absolutely hate radicals, most dictionaries include on'yomi and kun'yomi indexes, just remember that being able to look up a kanji by it's radical is a really useful skill, and once you get used to it (with your favorite dictionary) you can find things faster than wading through readings. If you bought or borrowed a kanji dictionary for class and it's collecting dust, pick it up, clean it off, and give it a try. Use it to wade through that manga you keep telling yourself you'll read but has no furigana. When you see something online, in a picture, on a sign in an anime, grab your kanji dictionary, find the radical, and look it up. The extra effort will help your Japanese improve, and your doorstop just found new purpose. 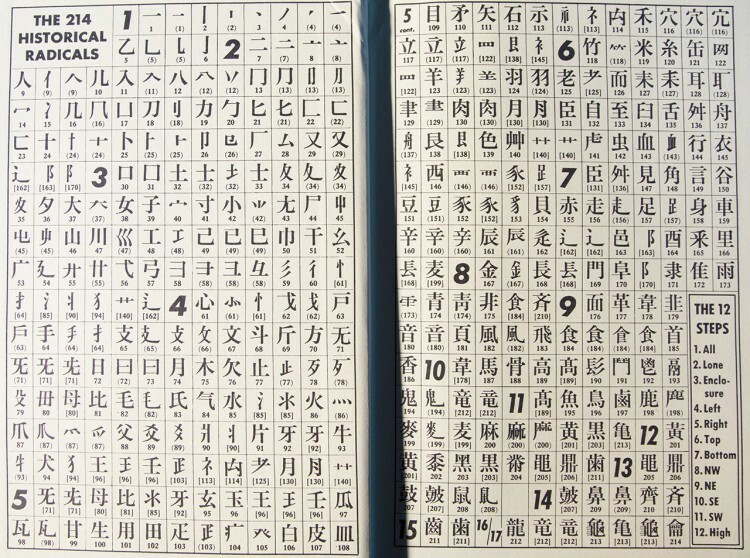 Next Article in Series Question: How Should You Learn Kanji?